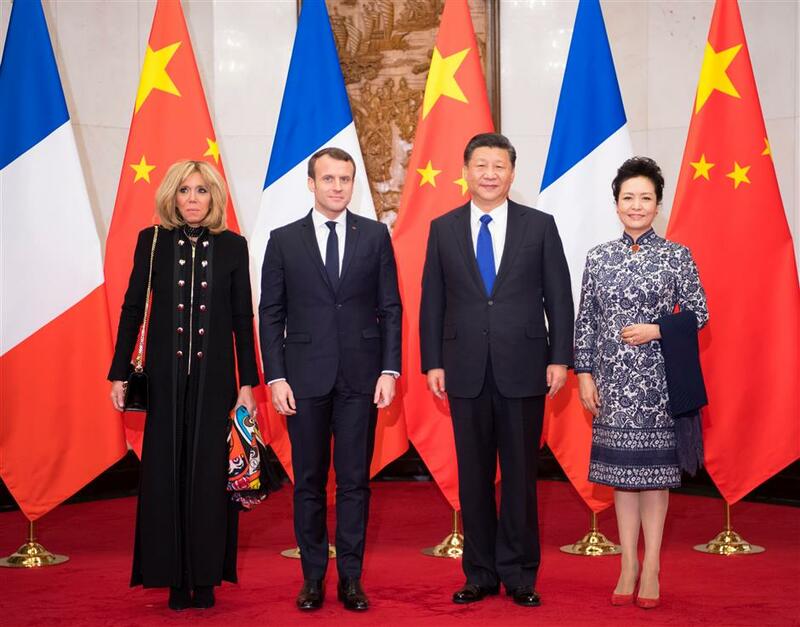 China stands ready to work closely with France to enhance cooperation, President Xi Jinping told visiting French President Emmanuel Macron in Beijing yesterday. Chinese President Xi Jinping and his wife Peng Liyuan welcome visiting French President Emmanuel Macron and his wife Brigitte at Diaoyutai State Guesthouse in Beijing yesterday. China stands ready to work closely with France to enhance cooperation including that under the framework of the Belt and Road initiative, President Xi Jinping told visiting French President Emmanuel Macron in Beijing yesterday. Xi said China attached importance to coordination with France on major international issues in the hope of promoting world stability and prosperity. France was the first Western power to establish diplomatic relations with the People’s Republic of China. “In the new era, we should follow the spirit of being responsible for history, stick to the right path so as to move toward a bright future of China-French ties,” Xi said. China advocated the building of a community with a shared future for mankind, Xi said, while France had similar views. “The two countries can enhance political mutual trust and fully tap the potential of cooperation transcending differences on the social system, development stage and culture,” Xi said. Macron said he hoped to increase mutual trust and advance France-China relations and EU-China relations via the visit. “France would like to take an active part in the Belt and Road initiative,” said the French leader, adding that France would work with China to address common challenges of the international community such as climate change. He said he believed that his visit to China would be a new milestone in the history of France-China relations. The French president’s state visit to China ends tomorrow. He arrived in Beijing yesterday afternoon after a half-day visit to the northwestern city of Xi’an. Along with his wife Brigitte, Macron visited the famous terracotta warriors in Xi’an, the Dayan Pagoda — a centuries-old Buddhist site — as well as the city’s mosque. Macron began the three-day visit in Xi’an as a gesture to Xi’s New Silk Road project, an ambitious initiative to connect Asia and Europe by road, rail and sea. The US$1 trillion infrastructure program is billed as a modern revival of the ancient Silk Road that once carried fabric, spices, and a wealth of other goods in both directions. Known in China as the Belt and Road, the plan is to see new road and rail networks built through Central Asia and beyond, and new maritime routes stretching through the Indian Ocean and Red Sea.